For the 5th annual LBI DXpedition, planning began earlier than usual, thanks to the national reduction in store locations by the US electronics chain Radio Shack in early summer which went along with a change in their store product lines. That event resulted in some serious bargains for many of our group who purchased adaptors, connectors, coax, wire, rotators, tripods, masting and other assorted goodies at savings up to 60% off. As usual, we attempted to select a weekend based on recurring geomagnetic patterns starting at 90, and then 60 days out. This year, there were no obvious quiet spells, as activity had been erratic in August and early September. Nonetheless, we set a dates of November 3-4-5, 2006 and the game was on. Antennas, cables, splitters (thanks again to Chuck Hutton for lending us several extra splitters) and other hardware were deployed efficiently, and without interruption by the local constabulary, thanks to Bob Galersteins having secured permission from the township for us to lay wires on thebeach beforehand. We also opted to reduce the length of our northeast (33 degree) BOG by a couple of hundred feet in order to avoid one of the main vehicle entrances to the beach. Brett Saylor brought along a GPS device, with which we were finally able to get a solid measurement on the exact orientation of our antennas. Our prior estimated had been 40 and 220 degrees, however these turned out to be closer to 33/213. 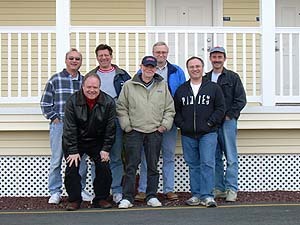 We employed both a Mark Connelly-designed broadband loop and a Craig Healy-designed copper pipe loop just outside the main DX room at the motel; however, even with the DX Engineering preamp, the signals from the former were lower than last year and somewhat erratic, which will likely cause some scrutiny prior to 2007, as that had been an excellent antenna at LBI-4. The copper pipe loop was unsoldered, and whether that was the reason or not, its signal level was below that of the BBL. Conditions were generally mediocre, although one short-lived opening to the Middle East was observed. Thus, we had a larger than usual number of Cuban Radio Reloj stations and NDBs logged. As usual, though, good company, good beer, and good pizza made up for the conditions. Can we move the 3rd wire on the 2nd layer to the 2nd spot on the 5th layer? This was our fifth outing to the New Jersey shore and we all had a blast seeing old friends, DX'ing, and catching up. We were all pleased with conditions last year and the year before, and all the indicators pointed to exceptional conditions this year too. I logged five new trans-Atlantic's (TA's) from home (inland New Jersey) in the two weeks before LBI and was looking forward to bagging some great new ones. Unfortunately, conditions were less than spectacular, despite the geomagnetic indicators. We heard our share of TAs, but (with a few exceptions) nothing that we hadn't heard in 2005 and 2004. The TAs we heard would have been great catches from home, but conditions were not DXpedition-worthy. Conditions on Saturday were particularly strange and changed minute to minute. We had an early mid-latitude opening, but after a few hours the TAs petered out, as did the domestic clears north and west of us, usually a good indicator of an aurora. So we started chasing DX on our southern wire and had some great catches, including Radio Formula, a low-power Mexican on 720 kHz. I camped out on 1140 kHz listening to a futbol match in Spanish, at armchair copy at times. While this could have been XEMR Monterey, I spent about 30 minutes hoping to pull out some information to ID the station, team or city names, anything. Before I could do so, the bottom dropped out of the southern opening and I lost them to a resurgent WRVA. That's 30 minutes I'll never get back! Based on our loggings this year and in the past, it seems like our southern wire is an excellent performer. I'll spend much more time chasing DX into Central and South America next year. Each year we try to bring something new to try out, whether it's a loop shootout or a new antenna to deploy, like Mark Connelly's broadband loop design. This year I decided to make a copper pipe loop based on Craig Healy's design. Unfortunately, due to lack of experience soldering copper pipe and running out of time, I didn't get it soldered in time. Still, we tried it out on Saturday by duct-taping the sections together. I plan to use it inside my shack with a CB whip as a phase reference. So far it's given promising results. I will get around to actually soldering it sometime before next LBI and might even make another to try phasing them at right angles to each other. All in all, LBI-5 was a blast, even if the DX was less than spectacular. Anticipation. The buildup to the first weekend of November began to crescendo, then reached it's peak as we started to "assume the DX position" behind our radios just before the sun started to set Friday afternoon. 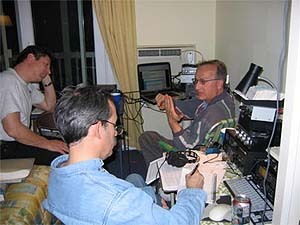 Each year, organizing the LBI DXpedition becomes more complete and efficient. 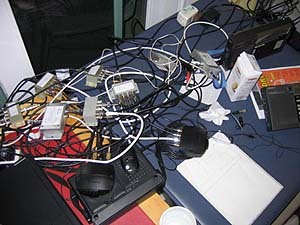 This in large part due to the Radiodxing.com website that the "MVP" of the weekend, Brett Saylor, set up. It became a clearing house for ideas on how to string the beverages, terminate them, what to bring and the DX targets we would attempt. Because of the prep, and also with the experience of the previous DXpeditions to Long Beach Island, our Friday "construction" of the beverages, their termination and the DX positions went so smoothly that my friend Glenn Small commented that he was amazed at the quickness of the assembly. Glenn was a newcomer to the group, a former NRC member, longtime ham, and a friend of mine since fourth grade. The set up was inestimably aided by Brett taking over where Radio Shack left off. "Saylor Electronics" contained every type of connector and cable known to humankind. We could not have done the weekend without Brett's most organized tool boxes. 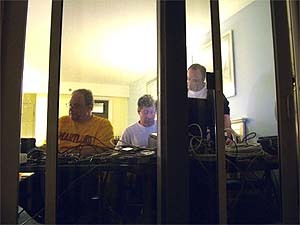 Once everything was tested and ready for prime time, I grabbed a bottle of my favorite ale, Saranac Adirondack Lager, and assumed the position in front of my radio, next to Dave Hochfelder and Glenn, looked out to the Atlantic Ocean, and tried to visualize the radio waves about to come in. Last year, at about 4:30pm, the Mideast boomed in at armchair levels for a fair amount of time. We hoped conditions would replicate last year, but it was not to be. Of the five LBI adventures we've had, the first two were busts as far as TA conditions and the next two brought fabulous conditions. This LBI session was between those - largely basic TA's and Latin Americans were received, but nothing spectacular. One exception - we logged a 250 watt Mexican and I was happy to get a clear ID on XEAVR-720. On the second night, with TA activity largely dead, we focused on Latins and deep south domestics off the south BOG, and were rewarded with S-35 signals from such stations as WSUN-620 and 940 Macon, Georgia. It is certainly a strange experience hearing an Spanish pileup of four South American (and maybe Cuban) stations on a given frequency. From the culinary standpoint, we were very happy that our breakfast restaurant, The Greenhouse Cafe, diagonally across the street from the Drifting Sands Motel, also served dinner to-go. This supplanted the usual Pizza Hut fare, and saved the ten minute trip back to the mainland to pick up the pies. Above all else, the level of camaraderie that was seeded five years ago continues to grow. After talking on the Manahawkin two meter repeater coming during the drive in on Friday, we didn't have to reintroduce ourselves to each other - we hit the ground running. This spirit is reflected in the way we report stations after the weekend - no individual credit. 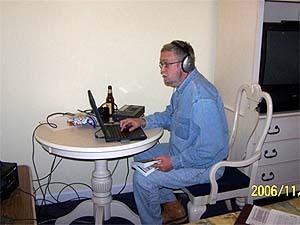 Using the wireless internet with starchat.net or good ole fashioned loud talking to others while wearing headphones, most of us received what everyone else was picking up. We only wish we had a couple more cups of Bruce's fine Scotch to celebrate some new countries. 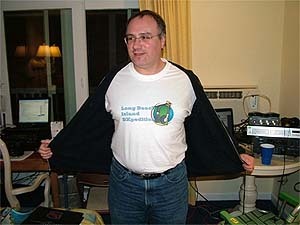 For me, LBI-5 will go into the books as a middle-of-the-road DXpedition, at least conditions-wise. While we heard a number of trans-Atlantic stations both days, none were in as good as the past two years. A combination of local TV interference and generally tepid conditions (despite the low A/K indices) made stations like the normally strong Virgin 1215 inaudible much of the time. Reception of TAs was limited to lower-latitude Europeans and North Africans; beyond that, reception was disappointing. We did pick up several Mexicans, Colombians and Venezuelans and the highlight of the weekend for me was Radio Formula on 720 kHz, a 250 watt Mexican from Veracruz. Apart from the lack of stations, the technical aspects of the weekend went very well. Antenna deployment went without a hitch in record time, although we did have problems getting the signals from our two broadband loops to both listening rooms consistently - we never did figure out if it was a cabling or splitter problem. Thanks to the past summers Radio Shack store closings, we have finally amassed enough components, wire and splitters to outfit our small army of DX'ers, so future DX'peditions should not require much additional equipment. Real-time chat via IRC #mwdx chat group provided room-to-room communications (like: "pizza is here!!!") 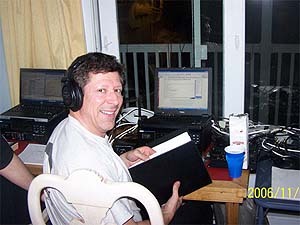 and also kept us in touch with other DXers such as Bruce Conti around the world who could compare catches and help ID unknown stations. The famous LBI DX-cam was also back this year, although it did experience some technical glitches. Some of the webcam pictures can be seen here. It was good to see last years newcomer Michael again the first night, and this years first-timer Glenns eyes were surely opened by the rapid-paced activity at sundown when the first signals start skipping in across the pond. Post-LBI eBaying has netted the group at least five more 6-way splitters, so combined with the existing inventory we should have enough antenna connections to support an even dozen DXers at future LBIs. 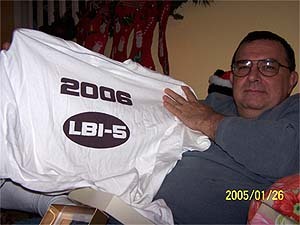 Bill models his LBI T-shirt, a Christmas gift from his wife! As always, the best part of the weekend was the fellowship and conversation among the attendees, and I continue to look forward to future DX'peditions! Although we did not hear many TAs as compared to previous years, we did hear some interesting Latin American stations. At the risk of sounding like a cliché, the camaraderie at these events is always worth taking the time to attend, regardless of what stations we hear. 216 3 Nov 2206 RMC Info, Roumoules France, Fair; weak with French talk. 234 3 Nov 2250 RTL, Beidweiler Luxembourg, Strong with pop music. 570 4 Nov 0239 CMDC R. Reloj, Santa Clara Cuba, Ticks and "RR"
700 5 Nov 0220 unID, SS DJ playing EE songs, at times o/WLW, HJCX? 720 5 Nov 0514 RJR, Innswood Jamaica, female announcer with mentions of "on 94 FM." 760 4 Nov 0304 CM?? R. Reloj, various Cuba, Ticks and "RR"
790 4 Nov 0307 CMAQ R. Reloj, Pinar del Rio PdR Cuba, Ticks and "RR"
820 4 Nov 0310 CMDE R. Reloj, Santiago de Cuba Cuba, Ticks and "RR"
850 4 Nov 0314 CM?? R. Reloj, Nueva Gerona Cuba, Ticks and "RR"
860 4 Nov 0316 CMDB R. Reloj, Baracoa Cuba, Ticks and "RR"
864 4 Nov 0053 France Bleu Paris(?,) France, Excellent; armchair copy. 900 4 Nov 0320 CM?? R. Reloj, Cuba, Ticks and "RR"
945 4 Nov 0156 France Info, Toulouse France, Excellent with male French talk. 950 4 Nov 0323 CM?? R. Reloj, Habana Cuba, Ticks and "RR"
960 4 Nov 0325 CM?? R. Reloj, various Cuba, Ticks and "RR"
1000 4 Nov 0338 CM?? R. Reloj, Cuba, Ticks and "RR"
1020 4 Nov 0341 CM?? R. Reloj, Cuba, Ticks and "RR"
1140 5 Nov 0125 XEMRp, Monterey NL Mexico, Strong with futbol; dropped out after about 30 minutes. 11,092.50 3 Nov 2329 R. St. Helena, Jamestown St. Helena, DX program, weak, stronger later in broadcast, lots of Peter Gabriel songs, mentioned the LBI DX'Pedition following our email report!